I have been asked a few questions recently about fishing Lake Taneycomo. After rereading all of my replies, I thought I would compile them and post them here for everyone. This information is just some of the things that have been productive for me over the years. They are not the only way to fish and not set in stone, but they are productive for me. I have fished T&A Rainbows on Taney during the fall brown run with success on both rainbows and browns. I don’t normally fish the big articulated streamers though. I do most of my streamer fishing at night and mainly do sight fishing during the day. During the day after sight fishing all my favorite spots, I will play with some small streamers, wet flies, and even do some midging. During the day I will use 6x if I can get away with it, but most of the time, 7x. If I’m throwing the small streamers, like that minnow fly, I will bump it up to 4 or 5x tippet. It seems like on a fast strip, you can get away with bigger tippet. More of working on a reaction strike than a feeding strike. Sight fishing in the slower water, they have too much time to study it and you hardly ever get away with anything bigger than 6x. Night fishing, I mainly throw the streamers size 6 and smaller. 10’s are probably my favorite, most productive sizes. The simple pine squirrel sculpins with a cone head work fine but pine squirrel does not come in white, so I use mink for that. I normally use 2x or 3x tippet at night. Leonards PMS, and Hybernators along with Mohair leeches are all great streamer patterns to use at night also. One thing to remember about night fishing……If you don’t get a hit or a fish in 10 casts, you need to change it up. Change color, change fly, change stripping action. There are too many fish out there not to get a bite in 10 casts. I normally start with a black streamer on a dark night and a white one on a bright moonlit night. The first thing I change, usually within 3 cast is my strip. Either a dead drift, to a slow strip with a pause between strips to short very fast strips. If nothing within 10 casts trying all those stripping methods, I change color. Colors I carry in the different streamers I use are White, Grey, Olive, Black, Red, and Purple. Once I run through all those colors in a certain pattern, I then change patterns and start running through the colors again. Sometimes you can get lucky on a good night and put to hand over 100 fish. Most of the time Ill catch 15-30 in a night. I do not always just catch big fish. 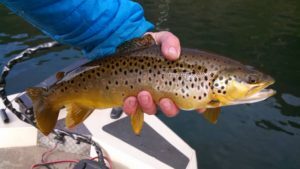 Most of them are average fish, but after fishing down there for several years, I have got spots that tend to produce bigger fish every now and then, so as you can imagine, I hit those spots every time I go. You can get the chamois on eBay. It has to be white sheepskin that is very thin for doll clothes. My 4 favorite midges are zebra, rusty, primrose and Pearl, and solid black. On high generation, if fishing the bank, I use White Chamois, Sow Bugs, Micro Eggs, San Juan Worms, and Midges. Favorite to least in that order. There are a lot of places you can still make your way down the bank with up to 3 units on. I use lots of weight to get it down fast. Sometimes up to 4 number 4 split shot. I place the split shot about 12 inches above the flies. Now on the midges, of course, you would not use any weight. I only use the midges when I can see lots of fish rising in the seems and eddies close to the bank and then will put one on about 12 to 18 inches under the smallest indicator I can get. Most of the fish will hold close to the bank during generation so you don’t need to cast out very far. Work the close seams and eddies within 10 feet of the bank. If I can see my flies on the short drifts, I will not us an indicator. If I can not, then I will put the indicator on. I love fishing down below outlet #2 with 2 units on. The water is perfect for fishing that bank under 2 units of generation. Just below outlet #2 is a tree that hangs out over the water with 2 units running. From that tree down, within 6 feet of the bank, usually holds lots of fish. There is a nice eddie just below the tree and then some giant boulders that create great fish holding eddies also. You can also drive over the dam and get access to the south side. The back side of the Island is a great place to fish during generation also.